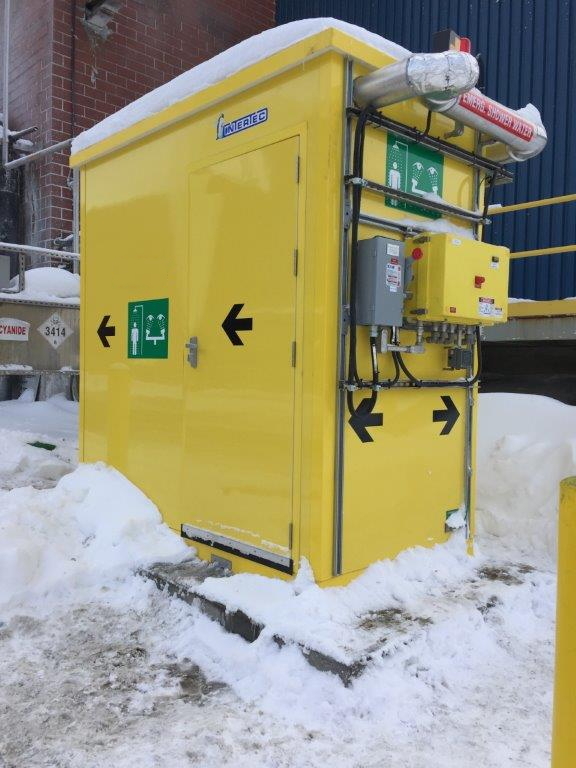 Sarnia, Canada, February 3, 2017 --- Today, Intertec Instrumentation launches a range of enclosed emergency safety showers for use in harsh outdoor environments. The emergency safety showers (ESSs) are integrated into shelters made from advanced composite GRP materials to optimize them for durability and long life. The exterior faces of the insulated shelters are 100% GRP (glass reinforced polyester) with an advanced UV-resistant gel-coat surface. Key application areas include oil, gas, chemical and petrochemical processing plants sited in Arctic or desert regions, offshore platforms and vessels, and harsh coastal locations. Two main shelter options are available, with enclosed square or rectangular shaped ESS showers of 4x4 or 4x8 feet (122x122 or 122x244 cm). The square format is ideal for outfitting as an emergency shower and eyewash station that can draw tempered water from a locally available source. The larger rectangular ESS provides additional space to accommodate a water storage tank and heating facilities. The special materials in the construction of these shelters are fabricated by Intertec Instrumentation at its North American factory and have been field-proven to offer advanced performance in the most extreme outdoor conditions. All of the shelters' panels are thickly insulated for very high energy efficiency, with two inch (50.8 mm) thick walls, roof and doors offering insulation values of R20, and six inch (152.4 mm) thick flooring offering an insulation value of R-30. A gel-coat exterior surface protects the shelter from UV ray degradation, and exposure to chemical and salt-laden air environmental conditions. The shelter wall, floor and roof panels are naturally fire resistant, and no wood is employed anywhere in the composite multi-layered construction. The resins and insulation meet the Class 1 flame spread rating of less than 20. The resin laminate is certified to the flame self-extinguishing standard UL 94 V-0. As standard, shelters are designed and constructed to meet seismic four earthquake ratings, and when anchored will also withstand extreme wind loads of up to 200 km/h with gusts of up to three seconds. The exterior of the shelters can be white (RAL9016) or yellow (RAL1016), and come with safety decals directing the user to the double-acting spring hinged doors. These crash doors include weather strips to maintain the best possible seal against wind, rain and snow. Many further outfitting options may be selected to suit particular application requirements. These include a choice of piping materials, drain locations, tank sizes, control and safety valves. Electrical options include variants for general purpose use or in Class 1 Division 1 or 2 hazardous areas with alarm options, internal heating, and more. Custom shelter sizes and designs are also available, and Intertec Instrumentation can vary the composite layered construction of the panels used to optimize shelters for the most extreme climate and application conditions. All Intertec Instrumentation ESS units meet OSHA and ANSI Z358.1 2014 standards. 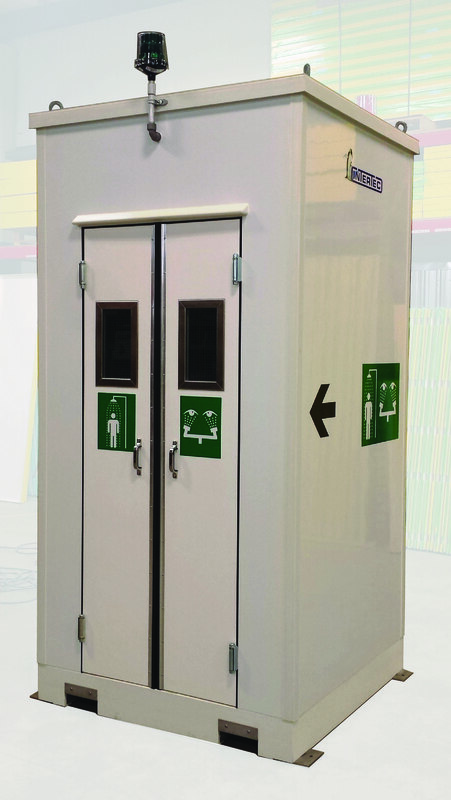 Intertec has launched a new range of emergency safety showers that are optimized for use in harsh locations. 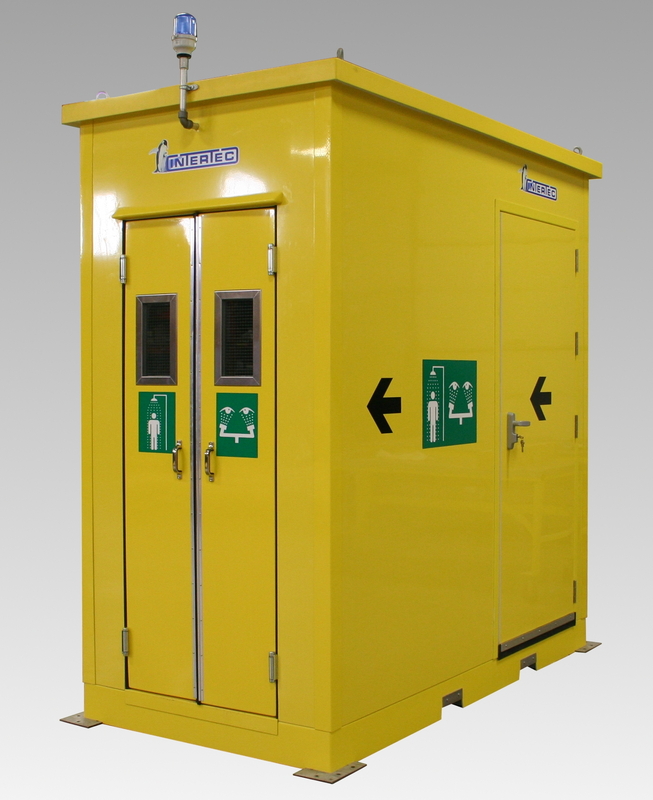 Intertec's new emergency safety showers will operate in plants located in the most extreme environments.